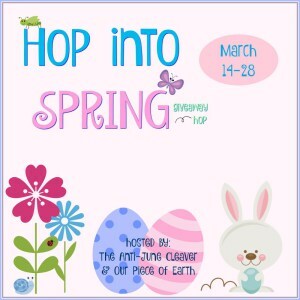 Spring is just around the corner and it's time celebrate warmer weather and longer days! We have teamed up with an amazing group of bloggers to bring you a bunch of great prizes to get you in the mood for fun and sunshine. As always, after you have entered my giveaway visit the linky at the bottom of each post to visit the other blogs for more great prizes. Bed and Bath Sticks, and Bursts! EnviroScent AutoSticks are a natural alternative to chemical-smelling car fresheners. These discreet scent sticks deliver a strong, quality fragrance and can be hidden just about anywhere in the interior of a vehicle, RV, or boat. Because AutoSticks are solvent-free, their fragrance quality and intensity do not diminish over their 30-day life span. Sold in packs of three, Available in four fragrances: Seaside Coconut, Coastal Storm, Rain Forest, and Showroom. 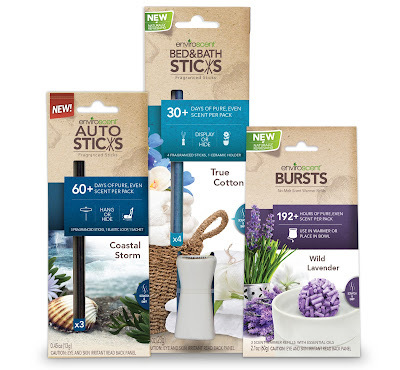 EnviroScent Bed and Bath Sticks are a mess-free fragrance option for your home’s most personal spaces. The seven-inch sticks last for 30 days, with a fragrance quality and character that remain consistent over time. Made from biodegradable paper, the sticks require no oil or heat and come with a free ceramic vase. Available in three fragrances: Wild Lavender, True Cotton, and Paradise Breeze. EnviroScent Bursts are a new, no-mess form designed to provide long-lasting, intense fragrance throughout the home. These scentwarmer refills work with most electric warmers and last for 64 hours – more than 2 times longer than a traditional wax melt. Bursts are entirely recyclable and available in four vivid fragrances: Wild Lavender, Paradise Breeze, True Cotton, and Amber Woods. I love my EnviroScent air fresheners! They keep my home smelling great much longer than any other product I've used. Plus, they're great for the environment! EnviroScent products are available online and at your local HEB stores. Enter to win a $50 prize package of EnviroScent products, a three months' supply, including three packages each of AutoSticks, Bursts, and Bed and Bath Sticks. To enter, just fill in the giveaway form below. Open to US residents, ages 18 and up. Giveaway ends on 3/28/16. Good luck!